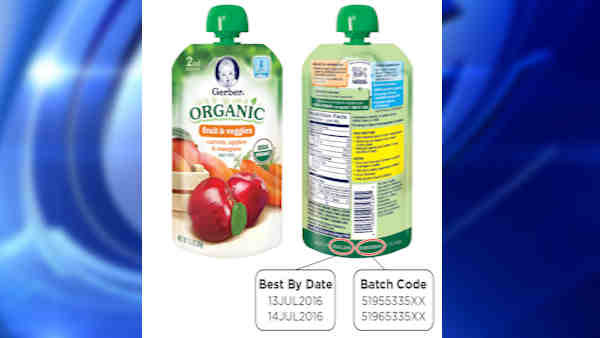 Gerber company is voluntarily recalling two batches of pouch food products. A package defect in some organic pouch products may result in spoilage, according to the company. Consumers may notice that, in some cases, pouches are bloated and the product tastes or smells off. There have been three reports of gastrointestinal symptoms, but the company said it cannot confirm that these were related to the product. Consumers should not use the product. The products were distributed at online and at retailers nationwide. Consumers who purchased the recalled pouches can call 1-800-706-0556 for a coupon.